Some might believe that art and science are nothing more than two different academic subjects that are part of school. They might also make the argument that art involves imagination while science involves reasoning. Nevertheless, the world actually needs those two opposing concepts because the world will not be what it is without the both of them. 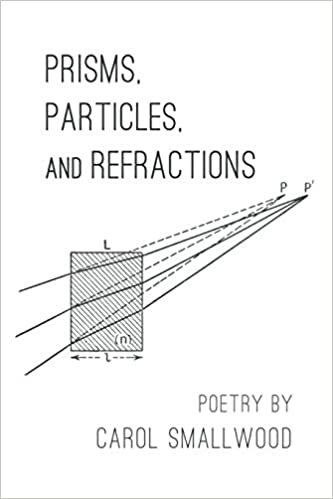 Carol Smallwood’s poetry collection Prisms, Particles, and Refractions effortlessly blends science with art. Carol Smallwood has the talent of making scientific concepts artistic. Her previously published poetry collection In Hubble’s Shadow also deals with science and the mysteries of the universe. Her writing includes a unique combination of traditional poems along with contemporary creations. It can be very challenging to create art, but Smallwood has done it again with Prisms, Particles, and Refractions. Readers really should enlighten themselves with the knowledge and wisdom that Carol Smallwood provides in her creative writing. The world really does need artists in order to educate others while providing beauty within the monotony of daily life. Life might be tough at times, but hope allows people to move on in spite of the darkness that is an essential element of reality. Because of the universal fact that there are both positives and negatives within all aspects of reality, it is a blessing to know that poetry can enlighten the mind and soothe the soul. Thank you, Carol Smallwood, for writing about fundamental truths within human existence!